The purpose of this guide is to provide helpful information related to the successful capture and handling of cats in emergency and disaster scenarios. 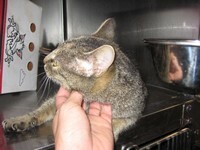 I have spent many years working in animal rescue under various conditions including wildfires, hurricanes, tornadoes, flooding, hoarding cases, and many other situations where cats need to be captured and removed for their own safety and survival. This manual is in no way complete, and will always be a work-in-progress as my personal experience continues to grow, as will the advice and input from others. I decided to write this manual in recognition of the special situation of cats in emergency situations. Cats are very self-sufficient creatures, and unlike dogs and other animals, are often difficult to locate, capture and handle under stressful situations. Dogs tend to be more visible, more vocal, and more willing to approach strangers. They do have their own behavioral and physical characteristics that make their rescue difficult (particularly size and strength) but in my experience, dogs tend to be the first animals rescued and removed from disaster situations. 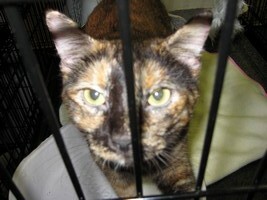 Cats are also the most likely domestic animal to be “left behind” during situations requiring evacuation. While we all wish owners would never evacuate and leave pets behind, it is an unfortunate reality, partly due to people’s awareness of the amazing degree of self-sufficiency of most cats. Unfortunately, no matter how resilient a species or specific animal may seem, under certain conditions all animals and humans require assistance and rescue to survive. It is my hope that the following pages will help ensure the rescue and survival of animals in dangerous situations and the safety and success of the people dedicated to that purpose. The bulk of this manual consists of “Tips and Tricks” along with what are considered “Best Practices.” None will fit every situation or will prove successful with every cat or situation encountered. As we all know, cat personalities vary widely, as do their particular ways of reacting to certain situations and environments. While some of the topics and suggestions provided in this document may seem obvious, my hope is that each reader will learn just one thing that helps ensure the successful rescue of just a single animal. This document is created with the sincere appreciation for all of those working in Animal Rescue, and my utmost gratitude to all of those who have helped improve my skills and techniques over the years. I specifically want to thank Meredith Shields, Allan Schwartz, and Jeff Eyre, formerly with the Humane Society of the United States, for their friendship and the countless things they have taught me, their dedication to animal welfare, and the thousands of animals they have helped over the years. Notice: While photographs on this website may depict the names and logos of various organizations, the views, opinions, suggestions and topics discussed herein have not been reviewed, approved or otherwise acknowledged by any organization and are solely those of the author. To those of you who have not yet worked in animal rescue during or after a disaster, I want to offer a specific warning and suggestion. As much of this guide suggests, there are dangers in such environments, both physical and psychological. As one volunteer I worked with during the weeks and months following Hurricane Katrina, an older gentleman and Vietnam Veteran commented, "This is worse than Vietnam... because Vietnam was cleaner." He was pointing out that the death, destruction, and the environmental conditions were dramatically beyond what the typical person experiences. As were the fears experienced (both real and perceived) based on some of the news stories and rumors circulating at the time. It is because of this, that I suggest that those not accustomed to difficult, dirty and dangerous environments or the psychological impact of both human and animal casualties, approach field rescue work carefully. A documentary entitled "Dark Water Rising" was released in 2006 that provides a glimpse into the conditions of animals and rescue workers after Hurricanes Katrina and Rita devastated New Orleans (although, it does not include much flood rescue work, as I recall a lot more water and mud than is depicted in the film.) The film is extremely graphic, possibly unnecessarily so, but fairly represents the conditions experienced by rescue workers with national rescue groups and independent volunteers. If the images in "Dark Water Rising" are too upsetting for you to view, then I would recommend against field work. While I still am upset by the images in the film, it is much worse being surrounded by such conditions than simply viewing them on screen. While the psychological impact of field rescue work can be dramatic, it are those moments when I know that if not for my being at the right place at the right time, an animal would likely not have survived, for me, makes the risk and cost of such work completely worthwhile. Some people may be better-suited to assist in safer, more controlled environments at base shelters. While working at these shelters, you will have the opportunity to love and care for the animals removed from disaster areas and will likely be able to venture into the disaster areas with experienced rescuers. This will help you gauge your comfort level and decide where your efforts are best focused for both the animals and for your own physical and mental health. After being in disaster environments for extended periods of time, I still recognize a certain need to "decompress" and grieve after leaving an area to return to my "normal" life. Varying degrees of PTSD (Post Traumatic Stress Disorder) are common and symptoms should always be acknowledged and treated without embarrassment. There are things you will see and experience in disaster rescue that will never leave you, memories and images that can haunt for many years. However, there are also moments of pure joy and exhilaration; very real expressions of love from the animals encountered, that can far outweigh the negative experiences and risks involved. You will also have the opportunity to meet countless other animal lovers; some of the best people I have ever met and friends I will have for a lifetime. It is my hope that this guide will better prepare you for such work and increase the likelihood of success and safety in your efforts and the safety and survival of the animals you encounter. Every person attempting the capture, handling and care of any cat should be fully aware of their potential “fight or flight” response to stressful situations. 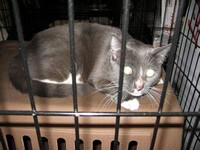 Even a seemingly docile cat can “panic” and react to capture, handling or containment with absolute ferocity. A cat’s ability to inflict injury and do phenomenal feats in their attempt to escape should never be underestimated. Cat’s can pierce even thick protective gloves and clothing with amazing bite strength, and claws can be used to shred virtually any material, particularly exposed human flesh. When frightened any cat can react as ferociously as any animal completely lacking in any degree of domestication or human interaction. It is because of the possibility of this “panic” response that all safeguards should be taken to protect cat and rescuer from injury and decrease the likelihood of escape. Rescuer’s Dilemma: Those of us who commit time and energy to helping animals in disaster situations often face a common dilemma. In many situations, rescuers will not know or control the ultimate destination of captured animals. It is sometimes a very serious concern that animals may eventually face unnecessary euthanasia or poor conditions at some disreputable shelter or worse, will be taken by a hoarder, masquerading as a shelter or sanctuary, a result most of us fear and dread. The ethics and moral issues surrounding hoarding and euthanasia are beyond the scope of what this document intends to address, but it is sometimes a possibility that we all must face. This is exactly why people wanting to assist in animal rescue should work within a large, reputable organization, who will carefully control where rescued animals are sheltered and will work hard to reunite them with their families. This document is meant to address situations where survival of an animal is clearly dependent on removal from a particular area; situations such as fast-moving wildfires are obvious, but so are situations such as hurricanes and flooding, where food and safe water are absent because the general public has been forced out of the area without expectation of return any time soon. In these cases, it is always necessary to capture and remove animals left behind to insure that they do not face death by starvation, dehydration, exposure to contaminated water, predation or extreme environmental conditions. If animals are discovered in areas where people will soon be allowed to return, or where they are safely contained and can be adequately fed, watered and monitored, it is sometimes best to “shelter in place.” This decision will always vary by situation, and your organization’s team leaders will help determine when this is the best course of action. The euthanasia question can often be resolved if you are working with a large-enough organization that can oversee the rescue, sheltering and ultimate destination of rescued animals. Coordinated Searches – Before deploying into any area for search and rescue, work within your organization and with other groups to coordinate searches to ensure no areas are missed. Particularly when going door-to-door use maps and landmarks to record areas that have been searched or where animals have been seen. When time and resources allow, areas, homes and structures should be checked more than once, but it is still good practice to maintain records of when particular locations have been checked. 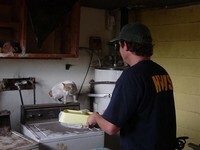 In-Doors – Often times, rescuers will approach an intact structure or home, and will have to use the senses of sight, sound and smell to try and determine if there are cats in need of rescue. Visually, by looking through windows and openings in the structure. The best indications that a home contains a cat are feeding bowls and litter pans. It is particularly clear that cats have been left behind when excessive amounts of food and water are visible or there are feces out in the open areas of the home. By calling out, you will sometimes hear a cat meowing in response, which is obviously a positive sign, particularly because it means the cat is desperate for human contact and/or food and water and will often foretell an easy capture. Scent can reveal the presence of cats due to the distinct scent of cat urine. Often times, a strong scent of urine will reveal a home with several cats, and occasionally, hoarding situations. Houses with Cat Doors: A cat door provides an excellent indication that a home contains a cat. If the cat door is “open” allowing passage, always make certain to latch, close or otherwise block the door before making entry into the home. If no cat is located within the home, it is likely that the cat has left the premises. It is recommended that fresh food and water be left in the home, preferably in a set live-trap and checked regularly (remembering to unblock the cat door.) Homes with cat doors often have more than one cat. Entering Homes – Before entering a home or structure, attempt to secure all exits, escape routes, and access to “inaccessible areas” such as crawlspaces, attics, insides walls, etc. Use Large to Small Isolation (discussed later) whenever possible. When it is necessary to force entry into a home, always do so with the utmost of care. Always remember that while you may somewhat resent the owner’s leaving an animal behind, remember that there are circumstances that sometimes force their doing so. Make entry (which should, when possible, be approved first by local law enforcement agencies) doing as little damage as possible for the benefit of the homeowner, and to reduce possible escape routes for otherwise contained animals. For the sake of the impression you will make on the owner (which will reflect on all of us dedicated to animal rescue), always act in the mindset of “do unto others.” Avoid damaging property and respect people’s privacy and possessions. Never remove anything from a home, and avoid taking anything even from a debris field outdoors. Removal of possessions is obviously theft, and even removal of items from a debris field can be construed as looting and can result in criminal charges. As a person working to rescue animals from any threat to their health and safety, always be mindful that you represent everyone involved in such efforts. Any illegal act, poor judgment or thoughtless mistake will reflect poorly on all animal rescue efforts and could possibly impact the ability for animals to be rescued in the future. My assumption is that only those sincerely interested in animal health and welfare would bother to read this document, so my hope is that these comments are unnecessary; however, it is always a good reminder. When removing animals from inside homes, realize that the owners probably fully expected to be able to return long before rescue of their animals was necessary. Always leave detailed information on the animals removed, and the information on where they are being sheltered so that they can be quickly reunited with their pets. Imagine being unable to return to your home and to your pets, blocked by law enforcement officials and worried sick about your pets, only to return and find them gone. It is sometimes possible to find contact information in the home which can provide a way for owners and pets to be reunited immediately. Contacting owners can also help you determine if there are other animals in the home, possibly in hiding, that need rescued. Whenever possible, it is recommended that an “official” representative of your organization contact the owners because you will sometimes encounter owners that may react negatively to entry into their homes or removal of their animals. Homes on Stilts: Frequently, in coastal areas where hurricanes are common, homes will be built high above the ground on stilts (similar to telephone poles) sometimes extending over 20 feet high. Unfortunately, while these homes will often withstand the storm, the storm surge rushing beneath these homes will almost always destroy the stairs leading up to the home. These homes can typically only be reached using a ladder, which are often available in nearby debris or standard equipment on your rescue vehicle. Before attempting to climb up to such a house, listen carefully for barking or meowing in response to calls and watch carefully for movement in windows, curtains and blinds (if the home has shatter-proof glass and is not fully enclosed by hurricane shutters.) If an animal is believed to be in such a house and a safe means of reaching it is available, attempt to climb onto remaining balconies or decks being extremely careful of their structural integrity. Attempt to listen directly to the walls, windows and doors and look through windows if possible. If an animal is inside a home such as this or any home fully locked-down with hurricane shutters, making entry can be extremely difficult and will likely require significant damage to the structure. In these cases, your organization should make certain they have already received permission from local law enforcement to make entry into homes containing animals. Rubble/Debris: When surveying a debris field, sight will obviously be the most useful sense, although sometimes an animal hidden in debris will meow or otherwise call out when a friendly voice is heard. 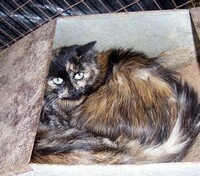 Rarely will a cat be physically trapped within the debris itself, but some owners are known to leave cats enclosed in carriers or cages thinking they will be “safer” in such confinement. Otherwise, most cats will be mostly be located by sight so constant visual scanning when in a debris field is of the utmost importance. When a cat is seen in the open, only approach if setting a live trap or if the cat is obviously calm and domesticated enough to allow contact, which is usually apparent in their body language and vocalizations. These cats will tend to approach once they hear a calm voice or smell food. Giving chase to a cat in the open will rarely result in capture and will only drive the animal into unfamiliar and possibly more dangerous areas. It is much more effective to set and bait a live trap and quietly back away from the area. Animal Tracks – In most disaster areas, mud will be everywhere, which can provide excellent indications of animals in the area. Typically, animals will remain in a familiar environment for an extended period of time after a disaster, usually only leaving when forced to seek food or water elsewhere or when chased from an area by people or predators. It is recommended that rescuers become very familiar in identifying tracks, particularly those of both domestic animals and the wildlife that lives in the area. Deceased Animals – While working in disaster areas, it is an unfortunate fact that you will encounter animals that did not survive either the initial disaster or have since died as a result of the countless dangers left in the wake of the disaster. For people new to animal rescue in disaster situations, this can be very emotionally difficult, and that is why such work is not suited for all types of animal lovers. It is important to be able to "set aside" the natural emotional response so that the rescuer can stay alert, safe, and move forward with rescuing those that have survived. While there may be a desire to bury deceased animals, the time taken to do so is better spent on searching for and rescuing animals that still have a chance at survival. While it may seem grim, photograph the animal and note both the description of the animal and its location so that this information can be logged to help bring closure for owners worried about a missing pet. If the animal is found deceased after a specific request to check on an animal by an owner, if possible, remove the body and return it to the base shelter so that the owner can be contacted. The owner can then decide if they would like to retrieve the remains themselves or have the local group or agency arrange for proper disposal of the remains. When removing a deceased animal, particularly from a residence, leave notification just as you would for a live animal, noting that it has passed to allow owners to know and provide closure. If the body of the animal is not removed, forward the information to the appropriate local agency so it can be removed to help reduce predation and the possible spread of disease or poisoning. 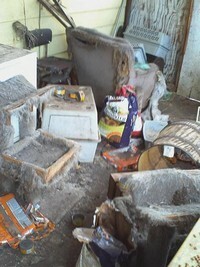 Hoarding and Neglect Situations – One possible benefit of disasters and the resulting search and rescue efforts is that otherwise unknown hoarding, neglect, and even puppy and kitten mills are discovered. Most people working in animal rescue are familiar with such situations, but for those that have not encountered these conditions, it can be extremely upsetting. While I will not spend time describing these situations, possible reasons they develop or psychology involved, it is a situation often encountered. In these cases, local law enforcement and animal control agencies should be notified, and provided photos and notes if they are unable to respond immediately, possibly for later criminal prosecution. Depending on how animals are contained, hoarding situations will often be the most chaotic rescue environments encountered and coordinated assistance should be requested to ensure that all animals are captured and removed as quickly and efficiently as possible. These animals will also be at the highest risk of severe illness or injury, and immediate veterinary care will often be necessary. The care and treatment of these animals, as with all rescue situations, is the primary concern, but so is the necessary notification and record keeping to ensure that the person or persons responsible will not be able to re-claim their animals or continue this inhumane practice. Involvement of your organizations leaders and local law enforcement is always necessary in these situations. Rescuing animals from a neglectful hoarding situation can be one of the most rewarding events in any rescue effort, but it can also be the most stressful and upsetting. Teamwork and mutual support among rescuers is critical, particularly for those who are encountering such conditions for the first time. The risk of PTSD needs to be considered for all rescue situations, but particularly for hoarding situations and breeding mills where conditions are often at their worst. Scents – The best “lure” for any cat is always going to be food… the smellier the better. A hungry cat can smell food from a significant distance and will move toward it, although hesitantly depending on the cat. When preparing to deploy live traps, pre-make a “Jug O’ Juice” by mixing strong smelling canned food, sardines, and even garlic with water in a plastic jug and shake vigorously. The "Jug-O'-Juice" provides a strong scent lure which can be drizzled around and outward from a trap 15-20 feet providing a trail to the food used for bait within the trap. You can also soak juice on strips of fabric or sheeting and tie to something above the ground so that breezes will carry the scent. However, do not put the juice on any material that might be eaten and risk the health of the attracted animal or other domestic animals or wildlife. Sounds – A high pitched “Kitty, Kitty, Kitty” will often attract domesticated cats who associate the sound to their owners feeding them. Men's voices are often not as well-equipped for high-pitched rapid calling, but a falsetto can work. Other sounds that can help attract cats is the sound of opening canned food, the sound of food shaken in a plastic container, or the sound of dry food being sprinkled into a dish or a spoon tapped as though dicing-up wet food. Lasers – “Red-dot” laser pointers, which make a fantastic lazy person’s cat toy, can also be used to lure a cat to, and sometimes into, a trap. This is often hit-or-miss, as some cats, particularly leery ones, will not even acknowledge or “see” the dot. I’ve personally only seen this tried once, unsuccessfully, but wanted to include it as a possible means of capture. 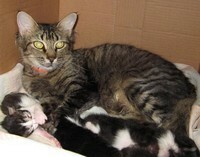 Kittens – Kittens are usually much easier to catch than the more experienced mother. However, nothing will attract a mother cat more than the cries of her young. If possible, secure the kitten(s) inside a small carrier inside a larger trap and eventually the mother will investigate in an attempt to free them. 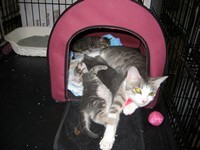 Be careful however that the kittens can not be injured if the mother reacts violently to being trapped. Familiar Actions and Sounds – Many cats will respond to familiar sounds and actions. With indoor/outdoor cats, the sound of a door being opened will cause them to scurry to the door, thinking they’ll be allowed inside, usually where they’re fed. On more than one occasion, cats that could not be approached will come to a door at your feet when you approach a door and appear to be opening it. The opening of a screen door or even the rattle of a doorknob or jingle of keys will sometimes produce this result. 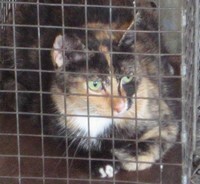 A rescuer can then scruff the cat to the ground, and either have a partner bring a trap (slowly and quietly of course) or the cat can be picked-up, placed in a net, or carried to an enclosure. De-scenting Traps – Often times, a rescuer will return to a set trap only to discover that they have captured a wild animal, including raccoons, possums, skunks and sometimes even larger animals such as coyotes or foxes. When this occurs, it is important to clean the trap to remove the scent left behind by the wild animal that would discourage cats with the scent of potential predators from approaching or entering the trap. 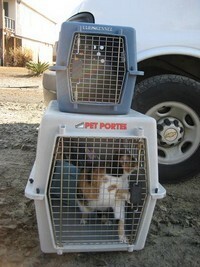 In my experience, live traps are the most effective way of capturing and removing cats from a disaster zone. In disaster situations, even the most socialized cat will hesitate before making itself visible or available to a stranger. Live traps allow a safe and efficient means of capturing cats, but should be used only under carefully considered situations when they can be monitored regularly. Live Trap Deployment – When moving into an area to place a trap, particularly if a cat has been seen, always move slowly, patiently and quietly. You do not want to significantly stress a cat into running far from the area where you will be setting the trap. Often, cats will hide not far from their established area. By moving into an area slowly and setting the trap quietly, making the often-recognized sound of opening a food can, you’ll arouse interest and the cat will approach surprisingly soon after you leave the live-trap area. Baiting – Use a soft strongly-scented food placed in the middle of the cage, just past the trigger mechanism. Whenever possible, use either paper trays or other material to put the food on instead of leaving it in the can. Leaving a food can in the trap can leave sharp edges that can injure tongues and mouths or possibly cause injury in a struggle to escape. Scent Streamers – The best way to attract cats to live traps is with scent. The canned food will usually have a strong scent simply by opening, but I suggest doing anything possible to encourage the scent to carry. Take a strip of light fabric such as from a sheet; and when the food can or pouch is first opened or when a "Jug-O'-Juice" has been prepared, drizzle the juice on this fabric. Tie this fabric inside the cage so that it flutters in the wind and the scent will carry significantly farther. Never use a piece of fabric small enough to be eaten, and for the same reason NEVER use just a scent strip without food as the cat is more likely to eat the fabric which can cause serious illness and death. Live traps are usually not well finished and rarely feature a coating over metal parts. The triggering mechanism can also have sharp edges. 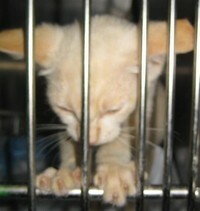 As such, an animal should be removed from the live trap as soon as safely and securely possible. 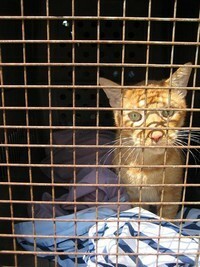 Nose, mouth and paw injuries are common with animals left for extended periods in live traps. 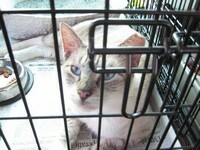 Cage Bottom Covers – Cats seem to recognize and be hesitant of stepping on cage wire. Whenever possible, cover cage bottoms with leaves, grass, dirt or sand to disguise and cover the metal cage bottom. If natural materials are completely unavailable, find very light pieces of cardboard or paper that can be used to cover the bottom cage of live traps. However, always make certain this material does not affect the trap mechanism and could not harm a trapped cat thrashing within the cage. 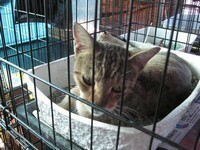 Material inside the cage can also make transferring the cat somewhat more difficult, and that is why I recommend natural materials. On anything other than concrete or large gravel, work the cage down into dirt, sand or grass so it virtually disappears. Sun Protection / Cage Covers – Always protect live traps from direct sunshine, heat, wind, water and cold temperatures. While no cat should potentially be left in a life trap more than a few hours at most, it is important to consider the environmental factors that could be detrimental to a trapped animal. The effect of shading and protecting a live trap can also aid in its disguise. Using branches and leaves when they are available will provide protective cover and will offer a more natural form of cover than human materials, which can contain scents that may be suspicious to a leery animal. Branches also provide a more “open” appearance to an animal giving the impression of escape routes. Boards, cardboard, tarps and such create a discouraging enclosed space. 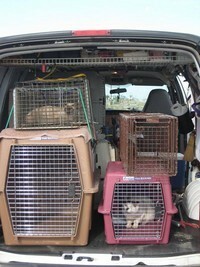 Multiple Live-Trap Placements – In my experience, live traps are the most effective way of capturing and removing cats from a disaster zone. There are rarely enough live traps available in most situations, but when you do have access to several, they can be deployed and monitored in a very productive way. Place multiple traps in an area or neighborhood, then circle back to the beginning once all traps are deployed. Often traps will be closed with a cat by the time you return to the beginning location. 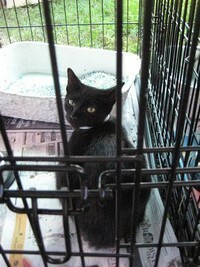 If you place traps after seeing specific cats, you can monitor whether the specific cats are caught. Then decide whether to re-arm the traps or deploy them to a new area. Often times, if one cat is seen, there tend to be more in a given area. Trap Location Records and Flags – Always keep detailed notes on the addresses and locations where live traps are deployed. Also, it can be helpful to note “landmarks” where live traps are deployed. In a debris field where street signs are gone or when GPS devices are unavailable, placing found items in highly visible unique locations can help identify where traps have been deployed. If available, small flags, like those used by electric and cable tv companies to identify underground cables, can be used to mark the location of traps, and removed with the cage. If such flags are unavailable, you can often use debris to make “flags” by tying rags to other debris. Spring Live Traps / Drop-Door Live Traps – There are primarily two basic styles of live traps, the spring-door trap, and the drop-door trap. I tend to prefer spring-door traps because I've seen more trap failures with the drop-door style, but both can be very effective. It is important to familiarize yourself with the available trap styles so that you can quickly and quietly set them in the field. It is also important to be familiar with the live traps so removal of trapped animals can be done safely. I recommend up-ending a live trap to remove the cat. This can be difficult if you have short arms and can't reach to the bottom to secure the cat, but it provides the most controllable means of removal. 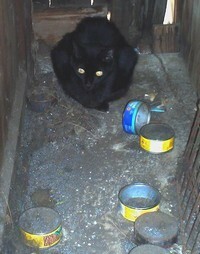 If the cat attempts to climb up and out of an up-ended live trap, the rescuer is able to block the entire opening with their chest, even if their arm is still down reaching for the cat. If purchasing traps or if they are available, some manufacturers make live traps with matching transfer cages. The back of these traps have a guillotine door which slides up but can be locked down when the trap is set. The matching transfer cage of the same dimensions can be joined with the trap. The two doors can be raised together always bracing the backs of both the trap and cage. The cat can be coaxed from the trap into the transfer cage, most easily by covering the transfer end and uncovering the trap end, then lower the door with very little risk of escape or the need to handle the cat in any way. When transferring to a carrier, it is good practice to have another rescue person holding the carrier securely against the ground tilted up with one hand holding the carrier and another on the carrier door to be closed on the handler’s arm as soon as the cat is in the carrier. The handler’s arm can then be quickly removed and the door closed and secured quickly and completely. Non-Automatic, Non-Live Traps (i.e. 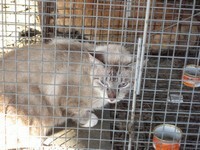 Carriers and Standard Cages) used for Capture – If live traps are not available, it is possible to trap cats using standard cages and carriers from a distance using rope or string. Tying a thin rope to the door of the carrier or cage and run the rope through the back of the cage using a length of rope that will allow you to move a distance from the carrier/cage. It is important to make certain that when the rope is pulled it will quickly and firmly close and hold the door while you approach the cage. When using this manual method of trapping, do not hesitate once you've added enough tension to the rope to expose your location or move the door. Once the cat is far enough inside the trap, firmly and fully pull the rope with quick, decisive force. Do not underestimate the strength or effort a trapped cat will exert to escape. Note: While cages often work better than carriers for this purpose, many cages with tray bottoms, have much wider-spaced openings in the wire on the bottom of the cage underneath the tray. When pulling the rope or in the cats attempt to escape, cages can be overturned, causing the tray to fall to one side allowing the cat to escape from the larger openings in the bottom. Always secure the tray to the bottom of the cage with zip-strips so that this cannot happen. A cat that has been trapped and subsequently escapes will often times be a thousand times harder to catch due to their hesitance to approach a trap again. 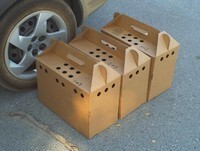 When using manual trapping methods, it is sometimes possible to trap more than one cat at a time. This can be a good thing because it is likely that if one cat is trapped and others are not, the commotion caused by the trapped animal and retrieving it will often make the remaining cats especially leery of the traps. 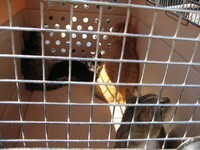 With multiple cat capture it is more likely that the cats may injure the other animal in the trap. Extra care and speed should be used to securely transfer them to their own individual cages if they react dangerously to one another. Approaching Traps – When approaching a cat in a live or manual trap, always do so quietly and “gracefully” to not frighten the cat that can be injured if it thrashes wildly inside the cage. 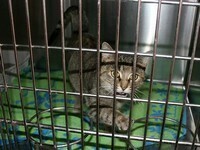 Always approach a trapped cat with some type of towel or blanket that can be immediately used to cover the cage. Covers will decrease the cat’s anxiety level and make lifting, carrying and transporting the trap much safer for both cat and rescuer. Time in Traps – It is important to regularly check on set traps. Cats can injure themselves in live traps because they can have sharp edges. 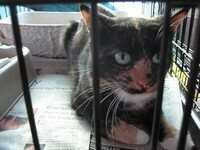 Cats left in live traps for long periods of time can injure their paws, mouths and noses in an effort to escape. There is also the concern of fire ants and other insects swarming the food left in a live trap. The stings can be deadly. Predators will sometimes approach and attempt to gain access to the trapped cat. While traps tend to be secure, some styles like the drop-door style can be opened if the cage is rolled. This could result in the escape of the trapped cat or death by predation. 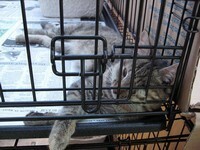 Even if the cage is never breached, this can result in an extremely terrifying and stressful time for the trapped cat. Whenever possible, avoid setting a trap and leaving it over-night. The odds for injury are higher the longer an animal is enclosed in a live trap. Large to Small Isolation - In any building, particularly when in a home, it is best to limit the cat’s ability to run from room to room and hiding place to hiding place. Typically a cat will run into a bedroom, bathroom, closet, etc. which should be closed-off whenever possible. Catching a cat in a 10'x12’ room can be done much faster, easier, and with lower risk of injury, than if a cat has an entire home to run through. If possible, a quick review of a room’s possible exits, hiding places, and potential hazards should be done immediately upon entering a room and closing it off. 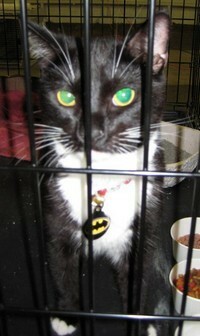 Windows, mirrors, lights, and other breakable objects can become sharp edges that can injure both cat and rescuer. Whenever possible, these items should be removed, covered, or otherwise protected from breakage. It is also sometimes necessary and helpful to remove certain objects, including furniture and mattresses from a room. It is important in doing so that the cat(s) do not escape into the larger unsecured areas of the home. Mattresses can also be used to cover windows, as cats have been known to break glass and push-out screens in an attempt to escape. Using mattresses in this way can both block a potentially dangerous exit, as well as remove the difficult hiding place that beds provide. Be aware that blocking a window will often greatly reduce the available light in a room which is why flashlights are an important part of a rescuer’s tool kit. Also, while searching for animals in a residence, be aware that cats often will find hiding areas in unexpected places, some that you may not initially think are accessible or large enough for a cat. Make certain to check in cabinets, closets, and under, around and inside every bit of furniture. Cats often gain access to the open areas inside of a bed’s box spring, so simply looking beneath a bed may not reveal cats that have taken refuge inside the lining of a box spring. Cats that can gain access to the back side or underside of dressers are also known to climb up into the drawers; so again, they are not discovered simply by looking underneath. When checking inside drawers, as with all searches, respect the owner’s belongings and privacy as much as possible. 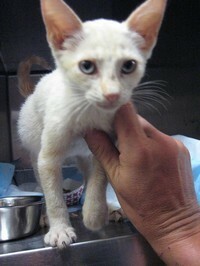 Gloves – Gloves are a necessity when handling frightened cats. A cat has an amazing ability to defend itself and escape capture. Heavy leather gloves are particularly important “in the field” where escape can mean losing an otherwise captured feline. Even heavy-duty animal handling gloves can be pierced. Bites and scratches are often inevitable even to skilled animal handlers, and it is important to accept this fact and be mentally prepared to withstand the pain associated with bites and scratches to avoid losing a captured animal. There are gloves available specifically for animal handling; but welder’s gloves, available at most large hardware stores, can work almost as well at a much lower cost. There are also gloves available with Kevlar linings and outer shells which offer better protection and are much thinner than heavy leather gloves. While they won’t necessarily prevent a bite injury, they do offer good protection while maintaining good dexterity. Scruffing – A cat’s skin is unlike a human’s in that there is a degree of “looseness” between the skin and the underlying muscle and tissue. A cat can be grasped, controlled to varying degrees, and lifted by grasping the skin on the back of the neck. Any cat that is not confidently known to be completely docile and in a controlled, escape-proof setting, should be scruffed for handling. Scruffing tends to also make a cat much more submissive as it harkens back to a mother cat’s control and transfer of young kittens, and it tends to cause an inherited submissive reaction. 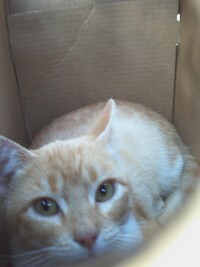 Scruffing also offers a much safer means of holding and moving the cat from the rescuer’s perspective. Obviously, if a cat appears to be injured, the rescuer should attempt to move the animal in a more careful manner. Claw Control – A cat’s claws can be incredibly sharp and used with amazing speed and strength by a cat undergoing escape panic. Protective gloves are very effective in protecting skin from deep scratches and any type of heavy fabric can also help reduce injuries. When lifting a cat, the rear feet can sometimes be grasped together with the other hand in such a way to both provide support for the animal’s body weight and to lesson the likelihood that the rear feet and claws will be used to provide a means to escape. Be aware that most scruffed cats are capable of pulling-up their rear feet to break free from being scruffed. A cat can be wrapped in a towel or other fabric to create a “cat burrito” so that their rear and front legs and claws are immobilized and safely protected against the cat’s body. Wrapping a cat will also limit their visibility and will result in less struggle to escape. Carrier Collapse – Carriers should always be inspected and tested for integrity before use. I strongly recommend the use of plastic zip ties in lieu of any clips, latches or even screws, all of which I have seen fail repeatedly in the field. Cage door closures particularly on the typical plastic carriers available at pet stores, are often not built to contain a cat experiencing escape panic and should be reinforced with zip ties when available. 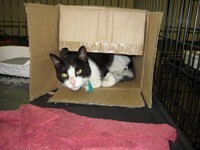 Cardboard Carriers – Cardboard carriers should only be used with extremely docile cats. 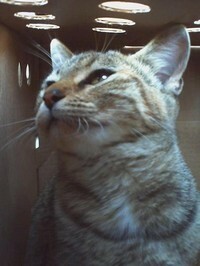 A frightened cat can often easily escape from cardboard carriers. Cardboard carriers are also are very difficult when transferring because the opening can not be easily controlled. 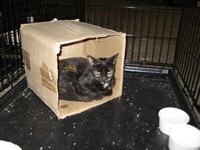 Use of cardboard carriers is best for docile cats and only opened for containment or transfer inside a secure enclosure so if the cats escape, they can still be contained for recapture. Pillow Cases – Pillow cases are often an invaluable means of securing and transferring a cat. Pillow cases should be inspected for holes and the strength of the fabric. A long pillow case can be tied shut, but be aware that pillow cases do not allow much ventilation, particularly for a stressed animal or if the fabric is wet. The time in a pillow case should be limited as much as possible. 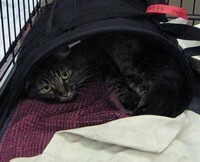 Never leave an animal trapped inside a pillow case within a secure carrier. Always untie the case and pull enough that the cat can see that it can get out of the pillowcase. Leave the pillow case in the carrier to provide material to hide in and to absorb urine and feces. 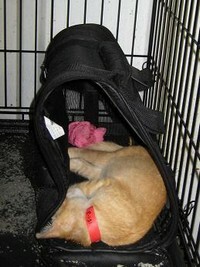 Makeshift Enclosures – When traps and carriers aren’t available, a quick review of your surroundings will often provide a temporary make-shift means of securing a cat. However, always fully insure the integrity of whatever is being used and evaluate its safety for the animal to be put inside. The material is also important because many materials can be torn or pried open to allow escape. When a cat is captured, when possible, have your team pause and remove the cat from the area placing it in a carrier if available. Avoid leaving a netted or pillow-cased cat in a room where other cats are being captured to avoid possible injury to the trapped cat. Always make certain to keep an accurate count of all cats captured, and always do a thorough search before leaving an area to make certain that no contained cats are left behind. Catch Poles and Cat Grabbers - I am not personally a fan of “cat grabbers” for many of the same reasons I discourage the use of catch poles on cats. Cat grabbers can place a great deal of pressure on the animal’s body and can allow violent thrashing that can result in injury. 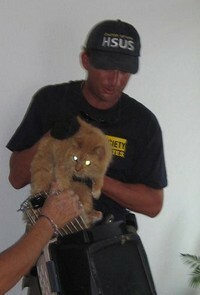 When using cat grabbers, always limit the extent to which the cat is lifted or suspended. It is also important to limit the speed and force used when attempting to “grab.” I have seen people exert enough force to pierce drywall; force that could severally injure the animal. There are times that a cat will be unreachable by hand and extended cat grabbers and catch poles are necessary to gain access to the cat. Due to the risk of injury, I sincerely discourage the use of such tools, and recommend the use of live traps whenever immediate removal is not necessary. 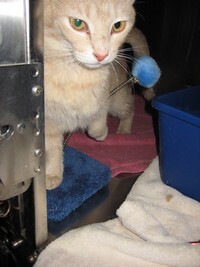 If forced to use a catch pole, attempt to loop around more than just the cat’s neck. Looping behind one or both of the front legs and always avoid lifting an animal using a catch pole to reduce the risk of injury. 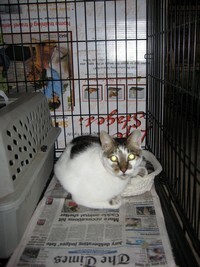 Netting - There are many types of nets available that can assist in the capture of cats. Nets can extend the rescuer’s reach and provide a safe means to capture the animal. Nets with large openings in the weave (like large fishing nets) can provide the advantage that a cat may run into the net not realizing it cannot escape. However, large-opening nets can result in legs reaching through the netting, as well as bites. Large-opening nets (and all nets actually) can be more difficult for transfer and the use of towel wraps are helpful. When using large nets to transport a cat, lift and twist the handle of the net, using the weight of the cat and the frame of the net to securely close the opening of the net. Specially-designed animal capture nets are available that allow the rescuer to slide-close the open net to make securing the animal much easier. Small-opening fine mesh nets are my preference as they provide a more secure capture. Drawstring nets are especially useful, but it is always important to test the retention strength of the drawstring before use. Transfer – Transferring an animal, be it from a live trap, cage trap, or any other secure enclosure is often the most critical part of a rescue. Many inexperienced handlers lose an otherwise secured animal because they lack experience handling and transferring and responding to injury. 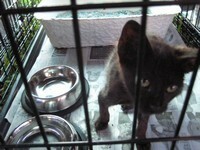 Always attempt to transfer within a secure enclosure so that if a cat escapes from the smaller cage or carrier or is able to break free from the rescuer, they are still “trapped” in a room, building or vehicle. It is important that anyone attempting a transfer be familiar with the possibility of “escape panic” and be prepared mentally and physically to possibly be bitten or scratched. Those of us dedicated to the rescue of animals recognize the possibility of injury and are mentally prepared to not allow the pain of injury to cause us to lose control of the captured animal. If you are in any way hesitant to attempt handling an animal, always ask those around you if they are more comfortable with the transfer. If nothing else, leave the animal in the current trap and transport them in it until someone with more experience can ensure a secure and successful transfer. Immobilization Chemicals – An animal who has possibly been without safe and adequate food and water and animals under duress should NEVER be administered any drug or chemical to calm it or render it immobile. 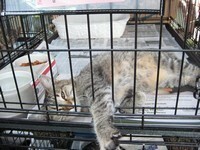 If an animal has been secured, allow it to relax with proper ventilation and available water. At no time should an animal be drugged to simply reduce its ability to fight or escape. These animals are far too susceptible to cardiac failure under such conditions, and the use of drugs should be strictly determined by a DVM; and then only when a medical procedure requires it. It has been my experience that animal control workers are sometimes quick to want to use chemical immobilizers and various drugs, and I have seen it result all too often in the death of the animal. Please speak to your team supervisor or veterinarian in charge if you witness such irresponsible use of such substances. 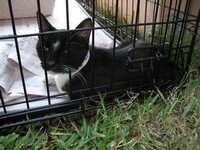 Always make notes on the specific address where a cat is captured, especially inside a home. If the animal is caught outside, note the nearest address or at least the nearest intersection of roads. This information can be used to help reunite owners with their animal family members. 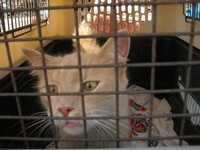 Always leave notice that an animal was captured and removed from a home, including the date, location, description of the animal, and the name and contact information for your organization and the location and contact information for the shelter or staging area where the animal will be taken. 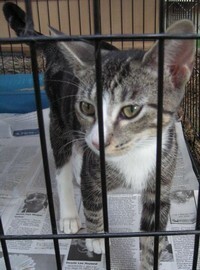 It is always best to kennel or cage cats inside a secure location, so if a cat does escape from their kennel, they can’t escape into the wild. While it is not always possible to keep kennels in a larger secure enclosure, do everything you can to block off exits and escape routes, and always keep nets, gloves, towels and other capture and handling tools nearby. Before entering a trailer or room with kennels or cages, always start by calling through the door, knocking, or only slightly opening the door to ask anyone inside if everything is clear. Never enter a kennel area if someone inside is handling a cat or has a cage open unless they give an “all clear” signal or specifically ask you to enter to help them, possibly with an escaped or unruly cat. If you are in a room, possibly cleaning or petting a cat inside a kennel, and a person carelessly enters, close the kennel door and hold it briefly and then suggest to the person that they enter and exit the area with more care and warning. 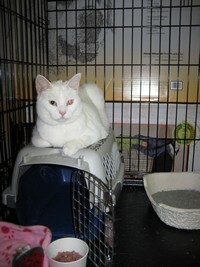 When cleaning and feeding cats in kennels, always carefully watch the cat for facial and body language that suggests an escape attempt or a tendency to lash-out and attempt to bite or scratch. If a cage or kennel is large enough, I always recommend putting a box with the opening to the back of the cage for the cat to hide in and block their view of the opening of the cage and the person feeding and cleaning their cage. This will greatly reduce the cat’s feeling of being trapped as strange hands are reaching into their cage. When attempting to touch or grasp a cat, first try to read its willingness to be touched or petted by initiating contact with a soft object of some sort, possibly the tip of a glove, a small towel, or possibly the paper trays often used for food. This allows you to determine if the cat will lash out without exposing your hands to possible injury. If a cat does lash out at a caretaker’s hands, attempt to be quick enough in retracting them to avoid contact, but if a cat does make contact with claws, realize that the normal instinct of quickly jerking back your hands can result in deeper, more serious scratches, If possible, leave your hand forward and the result will only be only a “slap of a clawed paw” and not deeper scratches. When providing assistance to veterinary staff, offer to secure the animal and hold it during the procedure. While most vets are skilled at safe animal handling, there are some that are only used to fully domesticated and docile animals. Veterinary staff are also of absolute importance in a rescue operation, and I would much rather sustain an injury myself than risk injury to a veterinarian. If an unruly cat requires inspection, shots, salves or a procedure of any kind, I recommend entering the kennel or cage with a towel. Covering a cat’s head and scruffing it with the towel over it will often calm the animal. The towel can then be used to wrap the cat like a “burrito” to safely contain and control the mouth, legs and claws. 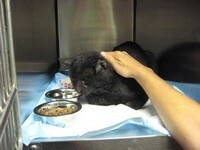 The towel can then be arranged and moved to give the veterinarian access to any part of the cat’s body. I recommend avoiding the tendency to hold a cat in your lap, unless it is a known calm animal. Holding a cat in your lap exposes legs to scratches and bites and greatly reduces your dexterity and balance. I recommend kneeling over the cat, holding it to the ground or surface of an exam table in such instances. Cage Set-up – I recommend placing cages close enough together that in the event of an escape a cat can’t fit between the cages. At the same time, restricting contact between cats is important to reduce the possible transmission of disease. If cages are being constructed directly out of their boxes, I recommend using the cardboard boxes as dividers between the cages. This reduces the cat’s ability to see other cats in such close proximity and eliminates the possibility of physical contact. If cardboard is unavailable, sheets can at least provide visual isolation and provide a calmer environment. Kennel Cleaning – Cleaning cages can be done quickly, calmly and quietly with calm loving words and touches if the cat’s demeanor allows it. I typically prefer to remove food and water dishes first and replace them last. Avoid the tendency to over-feed as this typically results in more difficult cleaning and wastes potentially limited food supplies. 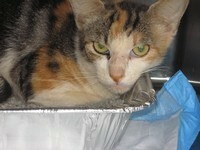 Wet food can be given in small amounts to win favor, encourage eating, and to provide fluids. 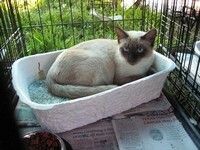 Litter boxes can often be scooped and reused without being emptied completely. If clumping litter is not being used, gently rocking the litter box to one side or another will expose the wet litter at the bottom, which can then be scraped or scooped out. 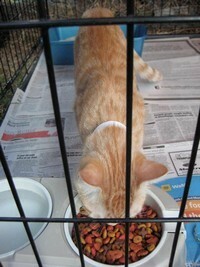 Most cages will have attached "care sheets" that will have sections to record notes on a cat's eating, drinking, urinating and defecating. These are important notes to keep as they can help veterinary staff identify possible health conditions. If towels are available, I recommend placing at least one in the cage. 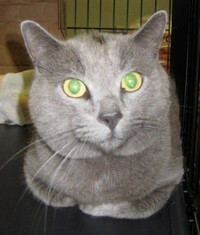 Towels will help absorb spilled water or urine and allow the cat to stay dry and warmer. 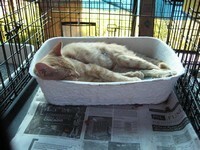 Puppy urine pads make good cage bottom covers, particularly when kenneled in steel-bottomed cages. When a cage or kennel becomes available for a new tenant, always remove every item and clean with an approved cleanser to kill viruses and bacteria. Do not re-use litter boxes, food bowls, towels or toys without their being thoroughly cleaned to avoid possible transmission of disease. 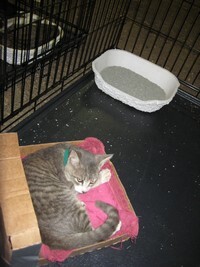 Again, the best way to clean a cage of a frightened cat is by giving them a box to hide in or behind, and it is always better to leave stray litter than risk reaching too close to the animal, which can result in escape attempts, scratching or biting. While not cat-rescue specific, I just wanted to add a few comments about general safety and other important miscellaneous topics while deployed on rescue operations. 1) Boots – Always wear thick-soled, heavy-duty boots while in a debris field. If you’ve never been in an area devastated by a hurricane, tornado, flooding, etc, then you will amazed to discover that there are thousands of nails, screws, and sharp edges EVERYWHERE. Tennis shoes, street shoes, basic rubber boots, etc. are not adequate to keep nails and such from piercing your feet and ankles. Heavy-duty, and even steel-toed boots, will repeatedly save you from injury in the field. It is important to consciously place each step taken in debris. While you will be inclined to focus on the animal being approached or scanning for movement in the field, you should be a very conscious of each step to protect yourself from injury. 2) Gloves – Similar to the dangers mentioned above and the fact that if you lose your footing, your hands will be the first to reach out for stability. Without gloves, you will cut and puncture your hands on the many sharp edges around you. Since footing is usually precarious at best, make a conscious effort to have a hand-hold on a solid object in case of a loss of footing due to mud or water, various chemicals, or loose debris underfoot. Here I am referring to non-animal handling gloves, as they are typically too bulky and hot to be warn at all times, and you would not want them covered in mud before needing them for animal handling if you were to slip. Kevlar gloves can provide a thin, protective shield to debris injuries and can also provide good dexterity and protection while handling animals which don't seem to require thicker, longer animal-handling gloves. 3) Clothing – Long pants of as thick of material as the weather will allow are critical in rescue situations and debris fields. Shorts should never be worn even in warm climates because of the added risk of injury. The differing qualities of natural and man-made fabrics should be considered for the specific environments you'll encounter. Hats can be a good way to protect your eyes and face from sunlight, but more importantly, the risk of blown or falling dust and debris. Safety helmets and eye protection should be warn in any situation where there is a risk of blown or falling debris. Hat brims can also protect the face and eyes from branches, wires and other objects. 4) Eye Protection – Sunglasses, if not true eye protection equipment, should be worn at all times, particularly in debris fields. I once had to leave a rescue operation due to a simple speck of dust in one eye. By the time I was able to reach an eye doctor outside of the disaster area, I had developed a fungal, bacterial and amoebic infection all in one eye due to the toxic conditions in the area. Without weeks of stringent treatment; I would have needed to have my eyeball removed to protect the infection from reaching my brain. Our vision is critical to our efforts, and I cannot stress enough the importance of protecting your eyes. 5) Mud – Even with extremely rugged boots with deep treads, mud will accumulate on your boots and make your footing extremely precarious. When stepping onto debris, always take a moment to wipe mud from your boots. Stepping onto any surface with mud on the bottom of your boots can cause an immediate and complete loss of footing regardless of the tread. If you think ice is slick, try climbing on plywood or any smooth surface with greasy-contaminated mud covered boots. 6) Standing Water – In any disaster situation where flooding has occurred, all sources of water should be suspect and exposure avoided. Water in disaster areas can be highly contaminated with any number of chemicals, bacteria, sewage, etc. and exposure can risk serious illness. If exposed to contaminated water, rinse thoroughly and seek first aid. Waterproof boots can be an excellent investment, and take dry socks along with you, so that wet socks can be removed immediately before irritation occurs. I also strongly suggest keeping anti-bacterial solutions and hand sanitizers with you at all times and used frequently, particularly between handling cats, and any time any surface is touched. 7) Hydration – Make a conscious effort to consume fluids whenever possible, particularly in hot environments. Even when you’re not consciously thirsty, take a moment to drink whenever possible. Dehydration can quickly lead to light-headedness, instability and impaired judgment, particularly in hot, poorly ventilated areas. I have read that even minimal dehydration can result in a decrease in brain function and fine motor skills by as much as 25%. It is recommended that every person consume one-half of their total weight of water (in ounces) every day under normal circumstances. I strongly suggest increasing this amount substantially (even if it means a lot more bathroom breaks) when working in the field. 8) Miscellaneous Tools – Other than the tools discussed above, a good flashlight, pocket knife and a reliable multi-tool, the one tool I have found especially helpful is a combination Hammer and Pry Bar made by Stanley and called a “FatMax.” This tool provides a good hammer surface for ‘knocking” and announcing yourself (and will greatly reduce bruising your knuckles) and also provides both a helpful pry bar and the claw opposite the hammer surface that is great for both grasping and moving debris without risking injury to your hands. 9) Knife Safety -While a knife is an important tool working in a disaster area it needs to be handled carefully, particularly in the presence of animals and other rescue personnel. You assume 100% responsibility for the safe use of any edged weapon when in use. Never use a knife in close proximity to animals unless absolutely necessary. Many uses for a knife can be done with less dangerous tools, including pliers and shorter, rounded-tip scissors. Always be aware that an animal may move suddenly and can be stabbed or cut if a knife is being used nearby. For example, when applying paper ID collars it is often necessary to trim off the excess strip of paper, but never use a knife this close to an animal for such a non-emergency task. 10) Visibility and Announcements – Bright clothing is helpful to make you "stand out" in a debris field. If you were to be injured, trapped or lost in some way, it will also make your own rescue much more likely. Also, when approaching homes, structures and debris fields, particularly when separated from others, constantly call-out who you are working with ("Animal Rescue, Hello?) so that you do not “surprise” other people in the area or in their homes. While it is sometimes counter-productive as it will cause animals to hide, it is more important to avoid unsafe situations with other people in the area. 11) Visual / Sound Contact with other Rescue Team Members – Whenever possible, people working in a rescue area should work in pairs. There are times, however, when an area can be covered much easier by splitting-up to a certain degree. When this is necessary, always maintain visual or verbal contact with your partner. By making announcements approaching homes and structures and by calling-out to animals, you can maintain contact with your partner. This constant contact between partners not only provides a level of safety, but also allows the team to communicate needs (for example, a cat is captured by hand but in panic cannot be safely moved. 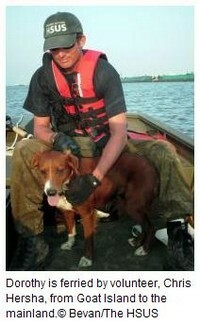 In such situations, the partner can bring nets, cages, carriers and such to assist.) Whistles should be carried by everyone and readily accessible in the event of emergency. Specific “codes” can be predetermined to alert others to immediate emergency conditions, assistance requested, and other events, including escaped animals particularly in shelter areas. Typically, three short whistles (or three of any sound or even object) is recognized internationally as a sign of distress. 12) Damaged and Unstable Structures and Surfaces: Always be very careful when climbing onto debris and particularly when climbing on anything above ground, including stairs, breached homes, roofs and other structures. Make certain that your partner or any other person is aware of what you are doing and is preferably monitoring your safety from a distance. NEVER climb onto any structure with another person anywhere below you or close enough to be injured if the structure collapses. If a collapse occurs, your partner may be your first and only source of immediate assistance and first aid and to summon assistance when needed. 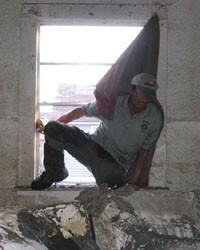 Test every step onto any raised structure or debris and listen carefully for sounds indicative of structural collapse. Do not take unnecessary risks particularly when there is no proof or indication that an animal is even trapped in the structure. Take turns climbing stairs and onto structures and keep a certain distance when on an unstable surface. This will help distribute weight that might otherwise cause collapse. If you find yourself standing on any material that is weakened, particularly from water, attempt to place footsteps on support beams. If you feel that you are at immediate risk of falling through any material, attempt to lay down and spread-out your body weight (just as you would do on thin ice) or distribute your weight by grabbing hold of solid beams or framework. If you do break through, attempt to arrest your fall by extending your arms outwards from your body. Any animal captured within such a structure or in any raised area should only be transferred down within a secured cage or carrier. Carrying even a docile, socialized creature down an unstable surface could result in severe injury to the animal should the rescuer slip or fall through any surface. 13) Residents and Other Non-Officials in the area - Always be aware that in any disaster area, there may be residents and others that remained behind. Many, but not all, of these people are appreciative of the animal rescue effort and will welcome you and be helpful. Always ask if there is anything they need, both for their general safety and welfare, but specifically in offering pet food and water if they have pets or know of animals in the area. Some residents after suffering the loss of their homes and possessions will voluntarily want to give their animals to you for rescue; some with the hope of reuniting in the future and others that will give-up their claim to the animals completely. 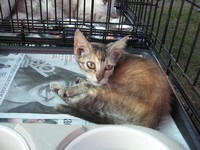 In these cases, even if it seems callous, do not judge their decision and always act in the best interest of the animal. Provide owners with destination and contact information should they later change their minds and wish to be reunited with their pets. They may initially react to the devastation with hopelessness, only later to realize how much they miss their beloved pet. In every situation, there will always be the risk of those people with bad intentions, and that is why situational awareness and personal safety risks should be considered at all times. Do not allow yourself to be isolated by strangers or expose yourself to personal risk of victimization. People who remained behind during a disaster and those that have returned, can be in a very precarious mental state. This is yet another reason to work in teams whenever possible maintaining constant visual and auditory contact with them. Always have some means of emergency contact with others by radio or cell phone (in the rare event that service is available.) Report any suspicious behavior you witness in a disaster area to local law enforcement or members of the National Guard who are often nearby. There have been many times that I have found myself in a disaster area so isolated that even my loudest screams or whistle-blows would not have been heard by anyone. While national and local police and military personnel are often dispersed through a disaster area, they can still be far beyond visual or auditory contact. 14) First Aid for Bites and Scratches – I am not a doctor by any means, but am aware of the importance of proper treatment of bites and scratches from unknown animals. Always treat bites and scratches as quickly as possible, using hand-sanitizing solutions, alcohol and antibiotic gels and creams. Hydrogen peroxide can be used, but I believe hydrogen peroxide tends to “seal” a scratch or bite, possibly sealing-in bacteria and viruses that have not been thoroughly cleaned from the wound. Various cleansers, antibiotic gels and bandages should always be kept nearby. In most disaster fields, particularly where flooding has occurred, it can be impossible to find any "clean" fabric or bandage that you have not brought along with you. If you have any questions about the proper treatment of an injury, there are typically people nearby with medical skills and knowledge. Veterinarians and Vet Techs will often be very experienced and knowledgeable in the best treatment options for animal bites or scratches. Anyone working in animal rescue should always maintain the recommended immunizations, tetanus shots and other health recommendations made by their organization. Pre-exposure rabies vaccinations are critical, as they could possibly help avoid a life-threatening condition and up-to-date tetanus shots are always a good practice. Always follow up with medical personnel or your family doctor to ensure proper treatment for any injury. 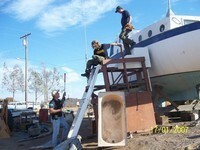 To ensure your safety, your team’s safety, and the safety of animals being rescued, never work while injured. You may incur further injury or have the distraction of your injury cause harm to those around you, human or animal. 15) Law Enforcement, National Guard and Other Officials – Often times, disaster areas will be off limits to the general public and will be patrolled by members of local law enforcement, outside law enforcement officers from other areas that have come to assist, and members of the National Guard. At all times, these officials should be treated with the utmost respect. Many of these officials recognize and appreciate the animal rescue effort, and on countless occasions, they have served as an extension of animal rescue efforts, both by capturing animals themselves and by pointing out areas where animals have been seen or heard. By being respectful, polite and friendly, these officials will also sometimes make it possible to work outside of established rules for curfews, allowing dusk or nighttime rescue work. You may also encounter officials who do not appreciate the work being done for animal rescue and will sometimes be specifically unhelpful. Regardless of an official’s attitude, always be respectful and do not directly question their demands. Always note any contact with law enforcement, and if one denies something granted by another official or department, respectfully ask if they could contact so-and-so with whatever agency to confirm a previous decision in your favor. However, even if you have received prior approval from a higher authority, be aware that if you disregard a direct order, you can be detained or arrested, which obviously wastes precious rescue time and resources. Recognize that these officials are working long hours, and if local residents, are also dealing with the stress of seeing their communities destroyed. While not all people share our compassion for animals, by being respectful and compliant, we can each help improve their opinions of the animal rescue community as a whole. Unfortunately, after some very improper behavior by some independent groups along with poor inter-personal skills by members of even the largest organizations, many states and local communities are hesitant to request help or allow access to rescue groups after a disaster. If everyone working in animal rescue recognizes that they are representing everyone else in these efforts, we can all help to improve people's impression and appreciation of our work. 16) Personality Conflicts and “Competition” between Animal Groups and People – Having worked in many disaster areas with different organizations and volunteering with many different animal groups, I have met and worked-with hundreds of people in animal-related organizations. I have seen enough over the years to know that, unfortunately, many of the same types of conflicts, personality clashes and politics that exist in ‘Corporate America’ also exist in animal-related organizations and efforts. These problems can actually be worse in animal organizations because of the passion felt for these efforts and the emotional impact such things have on us. In "Corporate America," office politics, competition, back-stabbing and rumor mongering are typically motivated by personal greed, but in animal organizations, they are typically motivated by a sense of “we know what’s best” or “we work harder than so-and-so.” The difficult thing is that these conflicts are caused precisely because of the passion we feel for doing what is best for the animals involved. However, it is because of the importance of our shared goals that these issues should be set-aside, avoided and quickly resolved if they develop. In a business, competition and conflict between departments, managers or employees may result in the loss of profit… but in our work, these petty issues can result in the loss of life of the animals we are working to care for and rescue. Of course, no one likes to be the one person day after day wiping diarrhea off the bottoms of cages, and we all hope that these less “glamorous” and more difficult duties be spread eveniy among the group of employees and volunteers, but if they aren’t and you find yourself feeling resentful, I would suggest taking a moment for reflection. It may be achingly hard, filthy work, and there may be those nearby not putting forth the same level of effort… but… you are there doing what you are doing for the love of animals to be rewarded by knowing you have kept them safe, made them comfortable, and shown them love and care. Therefore, other people’s efforts or lack thereof don’t matter. Yes, in most situations, there will be those who work harder than others, those whose experience is either lacking or exaggerated, those who work well with others, and those who will simply “rub people the wrong way.” Animal people sometimes gravitate to animal-related jobs and volunteer opportunities precisely because they prefer the company of animals over people, and some are perhaps lacking in the social skills that make them pleasant co-workers. It would be wise to recognize any of these possible traits in yourself to help you diffuse and avoid conflicts in the future. There are also sometimes significant differences in the underlying beliefs, purposes and efforts of different animal organizations, and these differences should be understood and accepted. It is best to seek opportunities with several organizations so that you can find the one whose mission and “personality” fits best with your own. Once you find such an organization, I still strongly encourage you to avoid falling prey to these types of conflicts. No single organization is “the best” or "the worst." Not one is the hardest working while another the laziest. We do this work to help animals, and it’s something none of us can do as well alone. In instances where you feel things are being done incorrectly, unfairly, or at worst, in any way not benefiting the animals being cared for, don’t hesitate to speak-up. However, I hope you’ll attempt to do so tactfully, because when conflicts among people arise it will always be the animals that suffer. Hopes for Change – Since Hurricane Katrina, there have been great changes in handling the evacuation, sheltering and rescue of animals in disasters. Groups like HSUS, ASPCA, Best Friends Animal Society, Noah's Wish, Petsmart Charities and other national and local organizations have made fantastic improvements in these efforts and brought a great deal of awareness, coordination and organization of these topics. I encourage everyone involved in animal rescue to support these organizations and their efforts. The American Red Cross along with FEMA and other federal and local governments and organizations have begun to include animals in their disaster planning and have helped raise awareness of the importance of not leaving animals behind during an evacuation. I would love to see a day when legislation was passed that allowed animal rescue groups to spay or neuter any animal they care for during disaster situations, but since states are having difficulty passing laws requiring spaying and neutering, I don't expect his to happen anytime soon. One possible addition to the materials local government and such provide in preparing for an evacuation that I think might be helpful would be Evacuation Stickers – For example, in the event of an approaching disaster (hurricanes being the easiest example) stickers would be distributed by general mail delivery that could make animal rescue more effective and efficient. These stickers would encourage people to evacuate with their pets, but in cases where it is not possible, make rescue efforts more productive. Such an item could be self-adhesive, brightly colored and posted by the resident on their homes, which would provide information about their evacuation, if pets have been left behind, and contact information. At the end of this document, I have included a prototype of the type of sticker that I feel would be very helpful in disaster situations. Please feel free to contact me with any questions or comments about this document. I welcome any criticism of these techniques and or suggestions that can improve the content. Experiences vary, and as I’ve said, not all suggestions are successful, or even possible in every situation. If your experience or training has taught you differing or better techniques, please let me know and I will update this document so that your experience can benefit others, and particularly the cats that we care for and work to rescue. Please email me at chersha@gmail.com with any comments or suggestions. Christopher Hersha has spent most of his life working in some degree in efforts to rescue and care for animals, both domesticated and wild. A retired IT Professional, Mr. Hersha first became interested in large-scale animal rescue while volunteering with Best Friends Animal Sanctuary in Kanab, Utah, now known as Best Friends Animal Society. 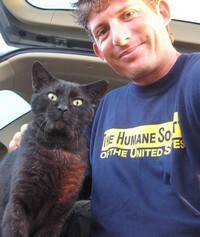 Since then, he has volunteered for, worked for or consulted for organizations both large and small, including National groups such as HSUS and the ASPCA, and smaller local organizations including the South Florida Wildlife Center, Animal Balance, FLSARC, SPCA Tampa Bay and the Johnson County SPCA in Indiana. Christopher has experience with virtually every type of disaster, including Hurricanes and Tropical Storms, Wildfires, Flooding, Tornados, Winter storms and other smaller scale scenarios where animals are endangered. He has worked across every compass-point in the USA from California to New York, Michigan to Florida, also including the Bahamas and as far away as Saipan, in the Northern Mariana Islands. While mostly retired from the rigorous demands of field rescue, Mr. Hersha commits time to developing a database application focused on the care, rehabilitation ...and, when warranted, the return of animals to their families... of animals post disasters and criminal seizures for such things as animal blood-sports, hoarding and neglect cases, and participates in spay/neuter campaigns with such groups as Animal Balance and others as much as time and resources allow. It is also his hope that his database will someday be made available for free to any and all animal rescue organizations and ''brick-and-mortar'' shelters throughout the world. Christopher now resides in Northern Indiana with his girlfriend, Annie, and their five cats, Buffy, Skoot, Socks, Phoebe, and Sylvia... all rescues of one type or another...of course. ____ (#) of People Remaining Behind at this Location. ____ (#) of Animals Remaining Behind at this Location. Food and Water left behind for approximately _____(#) days confinement. Please Rescue if _____ (#) of days have passed after evacuation. ____ Please Rescue Immediately if Structure is Breached (open) by Disaster. Please contact the above listed agency as early as possible to claim your rescued animals. * All Content Copyrighted. Please do not Copy, Reproduce, Distribute or Edit in any way without first contacting the author at chersha@gmail.com.